Ah yes, hello punk cadre. Long time no post, we know, but now we have news to bring you. 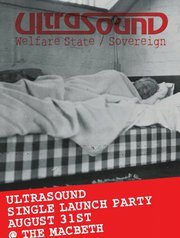 We shall be supporting the rather marvellous Ultrasound at the launch gig for their new single. This I am reliably informed will be their first 'release' since 1998 so should be some good, pent up energy to unleash there I reckons. This unlikely yet brilliant event can be witnessed by YOU with your own EYES and EARS at The Macbeth public house in London on August 31st. We will be on stage bringing the old Noise and Truth at 8pm, so get on down and SEE and HEAR us. We will be happy and then we shall watch the rest of the gig with you all. Real friendly like.